Check out these two resumes below. On the left is the original CV of our client, John Kee. 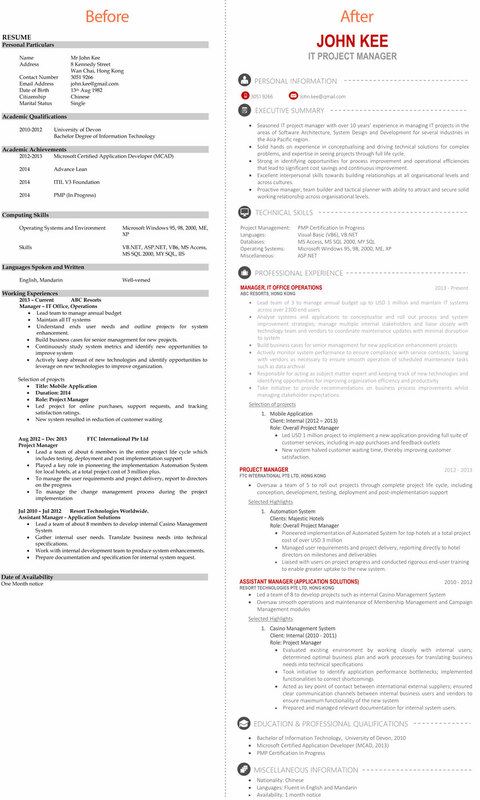 On the right is the updated version of his CV crafted by our team. We’ve reproduced his profile here with John’s permission. Over a 45 day period, we doubled John’s interview call ups. His new CV articulated his experiences far better and showcased his true capabilities. So how did we go from point A to point B? It starts with the client, and where they want to take their career moving forward. We ask clients to furnish us with job ads for positions they would like to apply for. The job ad lets our resume consultants know what exactly the client wants to do next, and what key skills need to played up in the new CV. Next follows a one-to-one phone interview between the client and their personal resume consultant. These phone interviews are just informal chats to better understand clients and their needs, and to discuss the strategy we’ve devised based on their original CV and proposed job ads. We usually talk through a client’s CV as it stands currently, and where they’d like it to be. We also discuss previous professional experiences, working together with the client to elaborate upon work scopes and highlight special achievements. – Let’s talk about your latest role. Give me a brief overview of your work there. – Now let’s figure out some achievements for your resume. Since you’re applying for IT types of jobs, it’s important to show your technical skills and project management experiences. Are there any large projects you’ve led? Check out this article we’ve written discussing how to best tease out achievements you’re your CV for a better idea of how our consultants might do this for our client. We replaced the original plain layout with a new layout utilising brighter colours & cleaner fonts. The composition also makes it easier to read it with just one glance. The moment a recruiter opens up this CV, they know that they’re looking at an IT Project Manager—that’s one tick box marked! The original CV did not contain an executive summary. 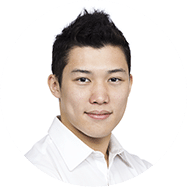 With this incorporated into the revised CV, any recruiter will know that the client has over 10 years’ experience in the specific areas of Software Architecture, System Design and Development in the Asia Pacific region. This one line alone might be enough for them to continue reading. The rest of the Executive Summary identifies the client’s strengths in IT project management—driving technical solutions, identifying process improvement opportunities, managing teams, and so on. Check out our post on De-mystifying Executive Summaries for more details on writing up a great Executive Summary. In the IT industry, a person’s knowledge and understanding of programming languages, operation systems, and other technical aspects is vital. 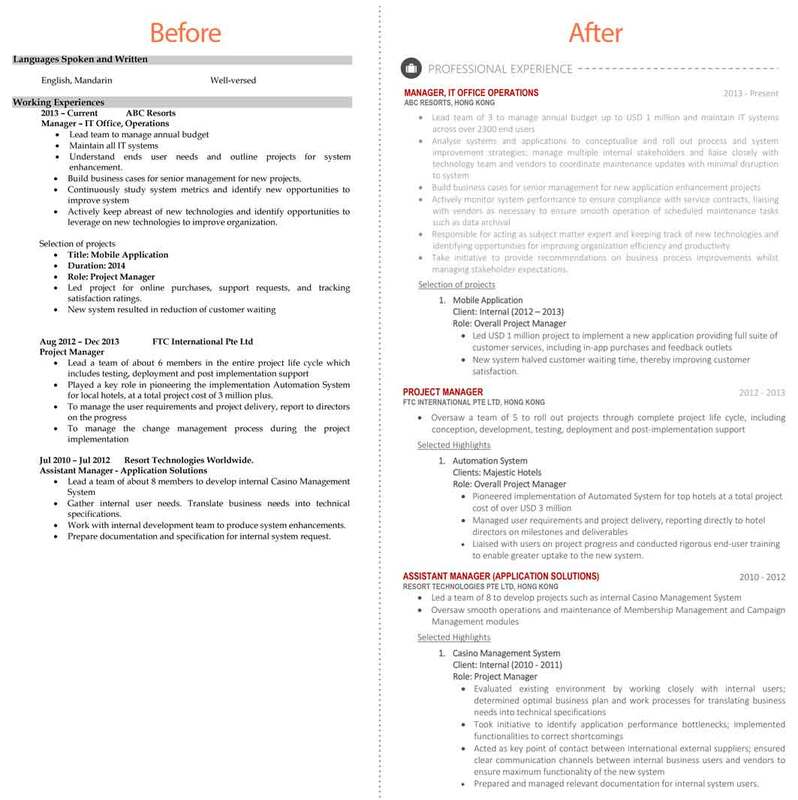 We’ve polished up the original client’s version and placed it just before work experiences, providing potential hiring managers with a one-glance overview of the client’s technical skills. This is also one place that our resume consultants have exploited key words—in this case, specific programming languages and operation systems—that will enable the client’s CV to pass through those tricky resume screeners. Check out our article about such resume scanning software here, for more information on how to bypass them! By quantifying the client’s work, we provide a more exact picture of his capabilities and value-add to his previous employers. This makes it more impactful to the reader. We’ve also incorporated and emphasised the client’s achievements, showing that the client has experience leading a high-value project from start to finish. Check out our discussion on how to write great achievements for your resume. These are important, but not as much as actual work experiences. So they’ve been moved to the bottom in the new CV. Note that the new CV mentions not only the university degree, but also the PMP certification—a much expected qualification in the IT industry. We’ve moved the miscellaneous pertinent details to the bottom in the revised CV, limiting them to languages spoken, notice period and citizenship, as these are the points that would be relevant to a recruiter, if any (they will want to confirm your ability to work in Hong Kong, your ability to communicate in the workplace, and how soon you might be able to start).